A few years ago at the annual Durga Puja, the organizing club published a booklet for the benefit of the generation born and raised here, explaining the significance and meaning of the festival and its various events on different days. Rightly so, the narration started with Mahalaya, the new moon day preceding the Puja. Mahalaya is actually a day when Hindus, typically Bengali Hindus pay homage to the ancestors, culminating in Sharodiya Durga Puja six days later. Indeed, it is a Hindu practice to invoke the blessings of the ancestors before any solemn occasion, be it a wedding or an Annaprasan. But that was not what the author of the little booklet wrote in his explanation of Durga Puja for our children. Mahalaya, according to his narrative was the day on which Calcutta radio broadcast an audio musical, Mahishasurmardini. And that was all, what Mahalaya meant! It was an ignorant and a weird way of explaining a significant Bengali institution to our children. It was like saying July fourth was all about fireworks. Hindu customs and religion are a little more involved and nuanced than of other major religions of the world. Its philosophies, theories and practices are not all explained and enunciated in a single book. Acquiring ultimate knowledge of our religion is just not memorizing one single book of scripture. As a result the Hindus, I think are a bit doubtful, if not confused about sources and meanings of our numerous and sometimes complex texts and edicts. So I do not accuse anyone of ignorance or lack of clarity about Mahalaya or Kali Puja or Kalpataru Utsav, a few amongst typical occasions very much confined to Bengalees. Many amongst us have no clue about historical and mythical background of even Durga puja, the mother of all Bengalee festivals. Of course you are guilty of no major crime either if you do not know all about our heritage, unless of course we desire to teach it to our “second generation.” Thus, we have to be very careful in the kind of epistemic inheritance we are providing for our next generation. In our desire to make very “cultured” Bengalees out of our children, the word that is kicked around frequently is heritage. Heritage is something that we inherit by our birth and which flows from being born out of certain parameters and culture of our parents and society. The larger question here is-are we the so-called first generation quite aware of our heritage? We first need to educate us on our heritage if we want to pass it to our children. Unless you own it how can you bestow it on others? I suspect not many of us have read Rabindranath, Sarat Chandra or Bankim Chandra in any depth; not many of us are aware of the work and lives of Sri Chaitnya, Sri Ramakrishna or Ram Mohan Roy. What is Bengali heritage without their legacy? How can we be aware of our heritage without the knowledge of the Bengali Renaissance of the nineteenth century? Let’s ask an honest question: how much do we know about the period of great awakening and reform which is unique in the history of all regional Indian cultures. I want to emphasize that this is not an all embracing assessment of or an expression of general disappointment about us that is the first generation here in the United States. There are members in our community who can really teach us about our culture and our heritage. Yet, I want to stress on the critical learning of our generation (the first generation) which may be a more universal concern. Let’s get to know our literature, our culture and our religion, in other words our total heritage before we exert big effort and throw in big money for the expressed goal of bringing our heritage to the second generation. Let’s start with the meaning of Mahalaya. 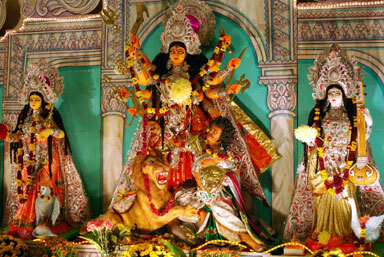 This entry was posted in Arts-Culture, Generic and tagged culture, Durga Puja, Hunduism, India, mahalaya, Music by sudipta. Bookmark the permalink. I found your article to be echoing my thoughts. How often we are guilty of preaching not only what we don’t profess but also what we don’t know. Totally loved the part where you talked about Bengal’s Renaissance and the legacy of Sri Chaitanya and Sri Ramkrishna.